A Kenyan national has been found dead in his apartment in Rinkeby, Stockholm. George Wanjohi, 74, was found dead in his apartment by the Social Welfare officers (hemtsjänst) who had come to check on him as part of their daily routine of checking on old people listed as needing assistance to perform their daily life rituals. News about Wanjohi’s death was broken to KSB today, 3rd April 2017 by Sofia Njoroge, a successful Kenyan business woman in Stockholm who had established contacts with Wanjohi’s family back in Kenya. According to Sofia, Wanjohi’s family had somehow picked signals that their kin had passed away in Stockholm and that they wanted the body to be transported to Kenya for burial. Sofia, who is in direct contact with the family, contacted KSB to help with investigations which could establish circumstances surrounding Wanjohi’s death and to unearth any information that could be helpful to the family. Subsequently, KSB’s Intelligence Secret Services (aka KISS agents) went to work and the following are the initial findings. After the Social Welfare Officers made the discovery that Wanjohi had passed on, they alerted the police who performed their investigations before an ambulance transported the body to the morgue. According to an official at the Social Welfare Office attached to the Investigations Unit of “Household Life” in Sweden (a unit charged with investigating circumstances around a deceased person), Wanjohi was found dead in his apartment on Saturday, 21st January 2017. However, the woman Officer could not say exactly when Wanjohi died. “We do not know how long he was dead before the body was discovered”, she told KSB on telephone. The Officer said that following the discovery of Wanjohi’s body, initial scrutiny of documents and other material in Wanjohi’s apartment did not reveal any contact details of any relative, friend or next of kin who could be contacted to help in linking the Swedish authorities with the late Wanjohi’s family in Kenya for purposes of organizing Wanjohi’s funeral. Although Wanjohi had lived in Sweden for close to 45 years, he was basically a recluse and social pervert who lived a miserable single life of isolation, away from Kenyans in Stockholm. After failing to get anybody who could link them to Wanjohi’s relatives, the Swedish authorities contacted the Kenyan Embassy in Stockholm for help. According to details on KSB’s desk, two officials at the Embassy who were in charge of the case were Mr. Robert Wasike, Deputy Head of Mission and First Councellor and Ms Salome K. Kagosha, the Second Secretary. Sadly, the two senior Officials could not help the Swedish authorities establish contacts with Wanjohi’s relatives back home even after Wanjohi’s personal details were availed to the Embassy. While this was extremely flabbergasting, the Swedes felt very frustrated. After hitting a dead end with the Kenyan Embassy, the Swedish authorities decided to follow Chapter 52 of the Swedish burial laws which dictate that under normal circumstances, a dead person has to be buried within 30 days after death unless otherwise. The Swedes had established that on paper, Wanjohi was married to a Kenyan called Lucy Njeri Njenga although an official at the Welfare Office said that Lucy was presumed to be in Kenya because she was not listed as resident in Sweden. According to records in the Swedish database, Wanjohi got married to Lucy on January 21st 2007. Wanjohi’s family has said that their kin was not married to any known woman and that he had no children. When contacted, the Kenyan Embassy could not reach Wanjohi’s supposed wife either so the Swedes decided that since the State was under a legal obligation to dispose of Wanjohi’s body, he would be buried in Sweden. By the time Sofia Njoroge contacted KSB, the Swedes were in the advanced stages of burying Wanjohi in Sweden. The last bit of official protocol is a document from the Swedish Tax Office giving a green light for Wanjohi’s burial in Sweden. The Social Welfare Officer in charge of the case and who spoke to KSB said that since Wanjohi’s relatives have been tracked down through KSB contacts, it is possible that the burial can be postponed with 30 days “to see what happens”. It there are no verifiable plans to demonstrate that Wanjohi’s family are making arrangements to transport his body to Kenya for burial, the late Kenyan will be buried in Sweden as per the Swedish law. The official said that another option is that the burial in Sweden may be delayed if Wanjohi’s family would like to send someone to Sweden to attend the funeral. However, the bottom line, from the point of view of Swedish Law, is that a verified member of Wanjohi’s family will have to be linked to the Swedish authorities for any discussions about further delays in burial to be effective. The Swedes said that although they can accept a 30 day delay requested by KSB on grounds that Wanjohi’s relatives have been found through a KSB link, they cannot ultimately deal with KSB on final decisions related to Wanjohi’s burial. 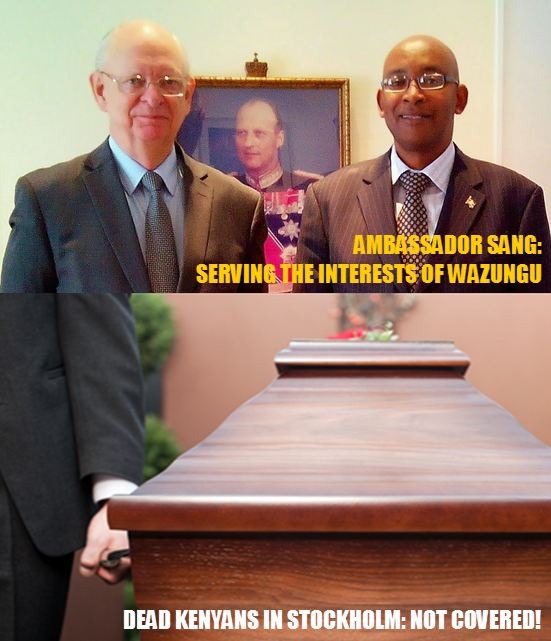 The official was systematic that it is incumbent upon Wanjohi’s family to communicate their wishes about Wanjohi’s final resting place to the Swedish authorities as soon as possible otherwise Wanjohi will be buried in Sweden without further consultation with the family and as stipulated in the Swedish law. A final option the official gave is that Wanjohi can be accorded a “temporary burial” in Sweden with the expectation of a future exhumation of the body to be buried in Kenya at an appropriate time. If this is the family’s wish, this wish has to be communicated to the Swedish authorities in time so that a special coffin can be used to bury Wanjohi temporarily as plans for his burial in Kenya are finalized. The official also said that in the event of a Kenyan burial, the family will have to foot the bill of body transportation to Kenya. Under such arrangements, the practice is that the Swedes foot the bill for the coffin, body treatment and transportation of the body to Arlanda International Airport then the family foots the bill from Arlanda to Kenya. On the whole, the big question which has to be posed is how the Kenyan Embassy could have failed to track down Wanjohi’s family in Kenya to inform them about Wanjohi’s passing even after his personal and official details as a Kenyan citizen were availed to the Embassy. For the Swedes, this was completely bizarre because the Kenyan Embassy is the official representative of the Kenyan government in Scandinavia and for the Mission to have failed to track down a single relative of a deceased Kenyan was fundamentally incomprehensible. Wanjohi’s case is further evidence that the Kenyan Embassy in Stockholm is just a building, the Kenyan Ambassador to Scandinavia a zombie on two legs, diplomatic staff at the Kenyan Embassy human robots, Uhuru Kenyatta, whom Ambassador Sang represents, a scoundrel while the Kenyan government, which the Embassy mirrors, is just another Banana Republic where nothing works! Seriously, Kenyans in Stockholm must wake up and renew protests against the Kenyan Embassy because officials at the Embassy are paid by tax payer’s money to look into the interests of Kenyans in Scandinavia. If the Embassy cannot even link the Swedish authorities to relatives of a dead Kenyan back home; to an extent that the Swedes opt for body disposal in Sweden, why can’t the Kenyan Embassy in Scandinavia be closed down? Is it time for Kenyans in Stockholm to set up a parallel Kenyan Embassy in Scandinavia? May be! He was called Waiganjo and not Wanjoi as I knew him.Sad. The thieving bastards want to know what we all earn. Starting in 2018, Kenyans working in the diaspora must disclose their income to Kenya Revenue Authority or risk penalties. KRA has given until December 31st, 2017 for diaspora residents to file their returns for the year ended December 31, 2016. KRA will investigate those who will fail to report their earnings and issue heavy penalties after assessing their tax dues. “We are asking these people to voluntarily come forward and take advantage of the tax amnesty. We are aware there are Kenyans holding assets overseas,” said the deputy commissioner in-charge of the policy and co-ordination unit at KRA James Ojee. Those who will obey the order during the one year amnesty will have their taxes, interests, and penalties from past years up to 2016 waived. Mr. Ojee told reporters that tax compliance in Kenya is very low with less than two million of the eligible ten million taxpayers complying. To successfully finance the Ksh2.6 trillion budget in the 2017/2018 fiscal year, the government hopes to raise Ksh. 300 billion ($3billion) by taxing individuals, properties, and businesses owned by Kenyans abroad. Consultants, auditing firms, artists, footballers, and athletes are the authority’s major targets. KRA said means of catching tax evaders will be gazetted. Cabinet Secretary for the National Treasury Henry Rotich already signed a multilateral tax information exchange agreement in Paris which allows 120 tax jurisdictions worldwide to share confidential information on individuals’ tax obligations. “We are just waiting for the gazette notice. Once it is gazetted then we are up and running. This is going to form the basis for investigations,” said Mr Ojee. “Those who come forward will be happier than those who say let us wait and see. So sad.May he Rest in Peace. This is sad new, may the Lord grant the family courage during this trying times.